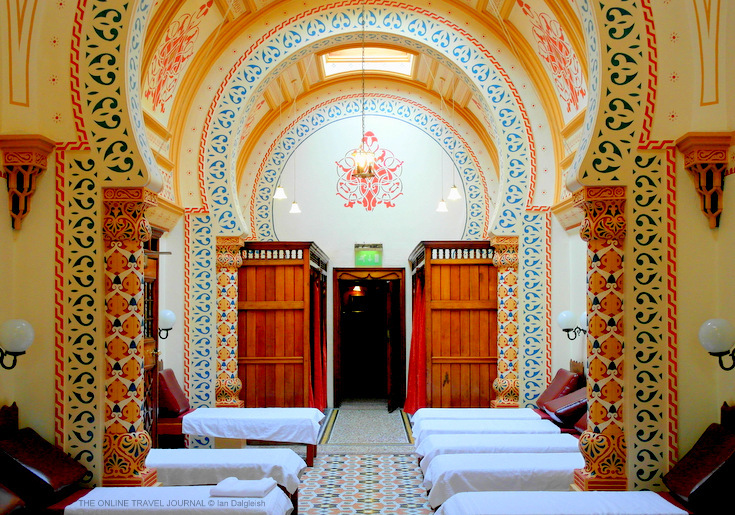 Forget taking tea in Betty’s famous cafe, the real treat, I think, should you be in the genteel north Yorkshire spa town of Harrogate is a visit to to the beautifully restored Victorian Turkish Baths. I thought it would be interesting to take a tour, once inside I really wished I had left time to experience the whole ritual of heating, cooling and cleansing in these fantastical surroundings. Somehow Moorish designs, oriental motifs and touches of Victorian decor meld together brilliantly to create a unique effect. 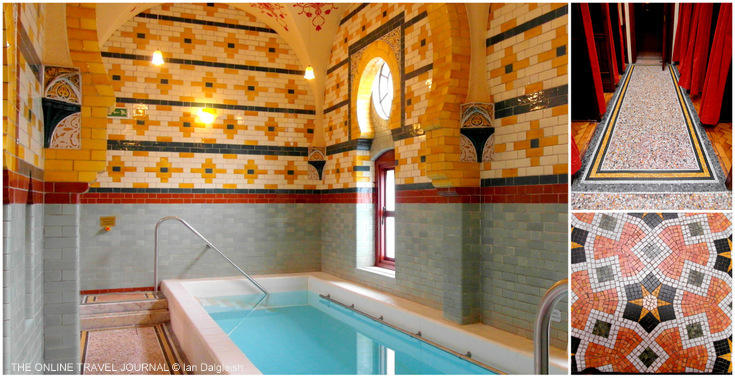 The baths opened in 1897 as part of the Royal Baths, a bigger international hydrotherapy complex that was the vision of former Mayor of Harrogate, Richard Ellis. Elsewhere in the building, part of which is now a Chinese restaurant, medicinal waters were dispensed, and a whole range of treatments were undertaken on the orders of resident doctors. A little document on the history of the Baths has illustrations of peat and sulphur baths and a slightly alarming photo of a Schnee Electrotherapy bath showing a chap sitting with forearms and feet immersed in wired up tubs of water. Turkish Baths were very popular with ever curious Victorians so open to taking up new ideas and first class baths like Harrogate were frequented by royals. Of the many baths that were built at this time only seven remain in Europe of which Harrogate is the most historically complete. Our guide, herself an enthusiastic user of the Baths was excellent. We shed coats and jumpers and followed her into warm, humid atmosphere of the changing rooms. Victorian ladies had maids to assist them with their many layers and numerous tiny buttons. Acting the maid our guide ushered her underwear clad lady through the baths, shielding her lady’s modesty with an imaginary towel. Standing between velvet curtained wooden cubicles unaltered apart from the addition of a hairdryer for we ladies who now have to tend our own hair, it didn’t take much to picture the scene. 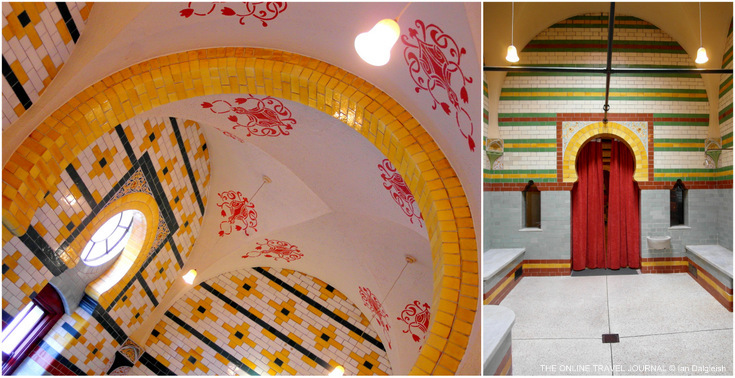 Scrubbed up and restored the baths are dazzling …. “Ah, that’s why” …. reproductions of Thomas Crapper & Company’s original ornately branded, sanitary ware make for much amused comment. Yorkshire man, Thomas Crapper was known for the quality of his bathroom fittings with several Royal Warrants to his name. Bold patterned, glazed brick walls in a warm colours complement the cold waters of the Plunge Pool. The pool was re-tiled and the original handcrafted tiles by Wedgewood around the side of the pool replaced - again with specially hand moulded tiles – during the 2002/4 restoration. 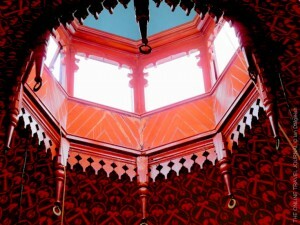 Top right, the changing rooms at floor level where wooden parque floors meet a mosaic walk way fringed with red velvet. And in the bottom right detail of the Terrazzo mosaic floor in the Frigidarium, laid by Italian craftsmen who worked in secret behind closed doors to guard their design. Here we are looking up at the painted arabesque ceiling above the Plunge Pool and on the right is the Trepidarium (warm room at around 120°F). 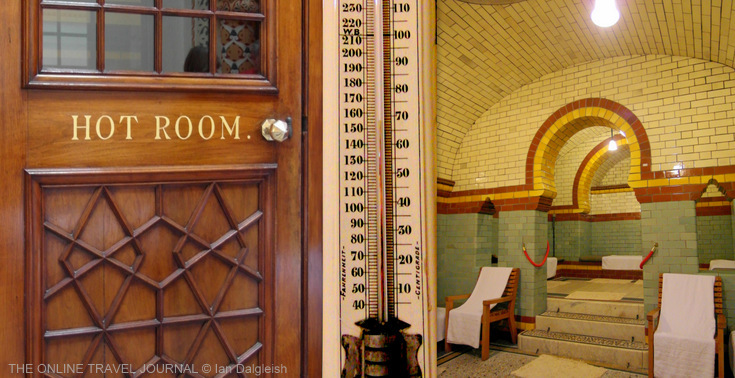 There are three hot chambers separated by the velvet curtains you see and a steam room. You can see the continuing theme of Islamic arches, picked out with yellow glazed bricks. The next step up is the Calidarium or Hot Room at up to 180°F (the temperature is not quite there on the thermometer, I guess the boilers were still getting up heat as the tour took place before the first sessions) and, up the steps the hottest part of the baths the Laconium heated to 210°F. In the hot conditions of the baths more stable hardwoods like mahogany are used for doors and furnishings. To complete the experience you retire to the Frigidarium (top photo) to relax on couches – it’s not actually cold as the name suggests. Victorians would take a little sherbet and, I read, wrote lyrically of feeling exhilarated at this stage of the process – I can believe it, in these joyous surroundings even foregoing the bathing process I felt uplifted. One more glimpse of the rich decor to end. Natural light finds its way into the building through windows by the plunge pool, skylights and this ornate cupola over the relaxation room. so if you have any information..
Our thanks to the Turkish Baths & Health Spa, Harrogate for the tour.